The Shannara Chronicles is a strange TV show. It’s clearly the result of some producer’s desire to replicate the crazy success of HBO’s Game of Thrones, but it fell way short. And maybe the reason is because Shannara is a standard-issue epic fantasy, and Game of Thrones is something different. Science fiction and fantasy are in a golden age on television right now, with shows like The Expanse, Game of Thrones, The Walking Dead, and others really capturing the attention of audiences and doing some interesting things with the genre. But The Shannara Chronicles is destined to be forgotten—and a big part of that might be the epic fantasy genre, which is hard to get right on television in the first place. Science fiction has a long history on the small screen: early television shows such as Captain Video and his Video Rangers, Buck Rogers, Star Trek, all the way up through more modern fare such as Babylon 5, Stargate, Firefly and Battlestar Galactica have dominated television at some point or another. And open-ended urban fantasy shows, like Buffy the Vampire Slayer and Supernatural, also have a pretty long and proud history. But epic fantasy on television? That’s a much smaller list. There’s few standout shows, like Game of Thrones, Legend of the Seeker or Xena: The Warrior Princess. Arguably, the epic fantasy genre works much better as a cinematic event, like Peter Jackson’s Lord of the Rings or Hobbit trilogies, for the most part. The Shannara Chronicles has some good things going for it: Terry Brooks’ Shannara book series has been going strong since 1977. MTV has clearly dumped a considerable amount of money into this production as well: it frequently looks fantastic, and the fact that they filmed much of it in New Zealand, makes it look stunning when they cut to a sweeping environmental shot. It’s even done a decent job getting the world set up, with a whole bunch of fairly detailed sub-plots that make the show interesting to watch week to week. But at the same time, The Shannara Chronicles never really captured the same complexity and seriousness that made Game of Thrones stand out from the rest of the pack. And honestly, The Shannara Chronicles’ biggest problem is its source material, because the story is about as standard as fantasy series come. A seemingly normal farm boy with a secret heritage? Check. Strong-willed princess? Check. Older mentor who represents the last of a heroic order? Check. A monstrous bad guy set on destroying the world? Check. A magic item that can stop the bad guy, that only the farm boy can use? Big check. These are all true, and in the show, we’re treated to a bunch of flat characters, many of which feel like they were on their way to a casting call for a show set in a high school. Add to that all of the clichés that get rolled out just about every episode, and this recipe leaves quite a bit to be desired. I think this problem with the underlying source material is why we didn’t see more from Legend of the Seeker, and why we’ve never seen shows made from major franchises like The Wheel of Time. It’s not a question of the quality of the novels—but rather, how well major fantasy arcs can be translated from one medium to another. Brooks’ Shannara novels, like the works of Goodkind, Jordan and all the rest, are enormous stories, told through thick paperback after thick paperback. But for all that, they also have a clearly defined beginning, middle and end, and lofty themes involving the epic struggle between good and evil. They’re not strong on concrete or immediate issues for characters to grapple with, or major shades of gray. Both science fiction and urban fantasy come from a more realist tradition than a lot of epic fantasy, which make them a bit more grounded in their surroundings and in their stories. This, in turn, translates into something that’s easier to adapt from pages to the television screen. That’s one reason why George R.R. Martin’s books felt so revolutionary when they first appeared in the 1990s—they defy the usual logic of epic fantasy, and include more nitty-gritty realism. And part of the reason for the success of shows like The Expanse and Game of Thrones is that their underlying source material is closely tied with the world around us. Looking for detailed political drama? Just look at Game of Thrones. Disenfranchisement and income inequality? The Expanse. Rules and ethics of warfare? Battlestar Galactica. And so on. 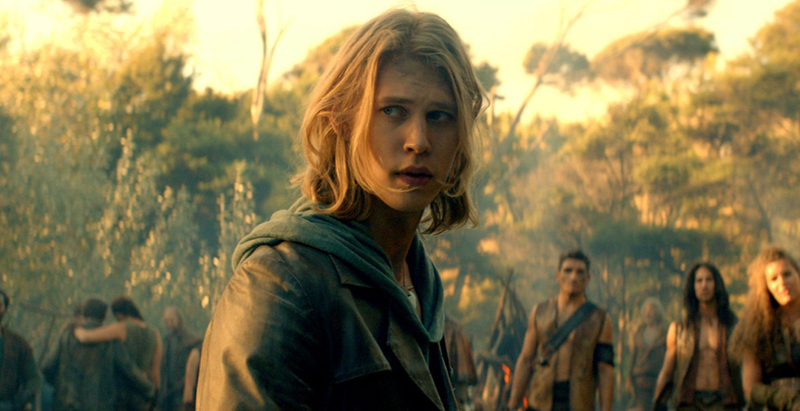 The Shannara Chronicles isn’t really covering the same ground. The epic struggle between good and evil is fairly abstract. And it’s harder to hit that theme with the same weight as with what we’re seeing in other, top-tier shows. Just as A Song of Ice and Fire made older epic fantasy series look a bit simplistic, Game of Thrones makes Shannara look obsolete. The sad thing is? There’s certainly plenty of building blocks that could have been used to make this a far more interesting show to watch, if the writers had been able to delve into the politics. The divisions between various human-derived races? The drama between the Elves and Rovers? How about the motivations behind the demons? Had any of those themes been examined for more than a couple of minutes in a serious fashion, this show might have had the roots of something interesting. The show was also consistently undermined by weak, poorly-written characters. Just look at Eretria throughout the season—she wavers between being caught in a really horrific situation with the Rovers, and wanting to get away, and then aiding them, when she could have escaped. Then there’s Wil Ohmsford, who continually reminded me of a level one adventurer from Dungeons and Dragons. By the end of the season, The Shannara Chronicles simply feels like a missed opportunity—and like a sad cash grab from executives who watched Lord of the Rings and Game of Thrones, and simply wanted to compete by creating their own show. As a result, they pulled all the wrong lessons of the successes of those franchises and came away with something that’s entertaining, but not memorable. And maybe the real problem is that old-school epic fantasy doesn’t work as well on television, especially once we’ve all seen something that turns the genre in a more realistic, complicated direction, like Game of Thrones.